Exiled creature with enters the battlefield. I'd recommend running more copies of Relentless Dead. Not only is it a solid card with recursion abilities, it gets better the more copies you run, as it decreases the chances they'll have sufficient blockers. 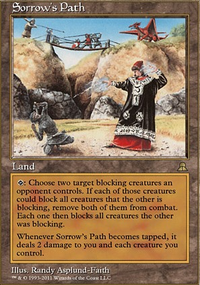 Gray Merchant of Asphodel is a pretty cool card in a mono-black deck, particularly when you're running cards with . Accursed Centaur isn't that exciting of a card--it's a 1 drop you can't play on turn 1, and puts you down a creature on turn 2. Cabal Coffers is pretty cool in mono-black decks. Cabal Stronghold is a solid budget option. You'l want some card draw. Vanquisher's Banner is a solid option in a tribal deck, though 5 mana is a lot to invest. Street Wraith or Gitaxian Probe (even without Blue) are fine options, as they get you a card for a measly 2 life. 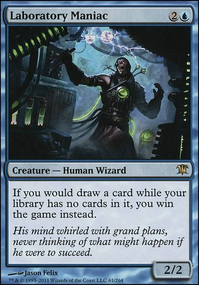 Or, since you're not restricted by format rules, you could run Necropotence, a card so powerful it makes Vintage's restricted list. Abyssal Gatekeeper, Accursed Centaur, Agent of Shauku, Altar's Reap, Apocalypse Demon, Apprentice Necromancer, Ravenous Demon Flip, Archdemon of Unx, Archfiend of Depravity, Banewhip Punisher, Betrayal of Flesh. Just a couple suggestions. Paradox Engine is very versatile. Sorry, Xira Arien wasn't a great place to carry out this conversation, but off the top of my head, you could easily do something with a self-sacrificing creature like Accursed Centaur and something like Zulaport Cutthroat. You could use Insolent Neonate to draw into your combo, and potentially have Razaketh lines. As for as Worldgorger, I don't like him in that shell because Arien allows you to draw your entire deck whereas Adun needs to be at sorcery speed. I could probably throw a sample list together for you if you like. ZestyTurtle on My pig is gonna fudge you up bro. Young Wolf is a little weaker, but one turn faster than your pig. I think it fits your deck better than Accursed Centaur. I know you have the sacrifice theme, so I think Altar's Reap deserves a spot, possibly replacing some of your ramp spells, since you don't have much to ramp into. 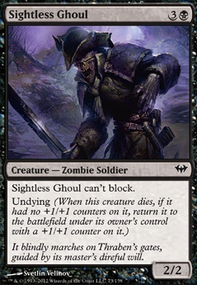 Personally I don't like Accursed Centaur (no synergy to sac another creature), Carnophage and Embalmed Brawler make you lose life (you only have 3 spells that make you gain 2 life each) and Ghoulcaller's Accomplice isn't a zombie. Gangrenous Zombies could be useful if you control a Snow-Covered Swamp, but you only have one. Also, assuming you control your snow swamp it would be an almost guaranteed boardwipe unless you have zombies with higher toughness than 2. Shepherd of Rot is a bit dangerous if you don't have lifegain. Twisted Abominations are coslty and you already have 24 lands, so are you sure that they are useful? In my opinion, Clutch of Undeath is too colstly for its effect, but I reckon it can be versatile. For Zombie Infestation, you don't have many choices of cards to discard, unless you discard lands (if you are mana flood), or maybe the abominations. You have only 2 cards with madness ( Gisa's Bidding). You really don't need Ghoulcaller's Bell because you don't mill the opponent with any other spell in the deck. I'd also remove Vault of Whispers. Keep that card for an artifact deck. So, exile a creature with Cloudshift ,for example: Accursed Centaur his ability will not work? I playtested this for a few games and its actually really strong. Apprentice Necromancer was a super strong target to bring back and Magister of Worth was great. I think you should replace Accursed Centaur though it didn't really seem to do all that much. You have enough sac outlets already. Have you considered putting in Golgari Charm? Regenerate all your guys following a board clear. also i'd replace Drana's Emissary with Vampire Nighthawk or another creature along those lines. it's a flying deathtouch with lifelink and good stats that can help defend you until the late game. i might also consider putting in a Splinterfright, Golgari Grave-Troll, Ghoultree or Mortivore just so you have the option of summoning a huge beater from your graveyard along with the rest of your creatures. imagine the effort to remove such a huge threat only to have you just summon it again the next turn or regenerate it. They also can finish games if sacrificed with Jarad, Golgari Lich Lord or have trample with cards like Brawn or throw in a Rogue's Passage to your landbase and swing for the kill. 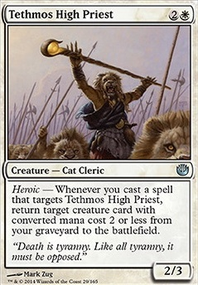 Also consider a Sol Ring, Temple of the False God, Altar of Bone, creatures with the devour mechanic like Mycoloth(also makes tokens that can be sacrificed). Also if you want to be more sacrifice oriented you can use token creation cards like Abzan Ascendancy, From Beyond Golgari Germination, Spirit Bonds, Sengir Autocrat, Marsh Flitter, Creakwood Liege (works twice on multicolor), Sifter of Skulls. 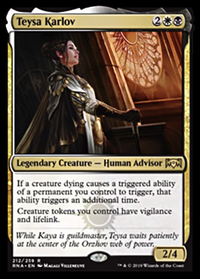 Tokens can make cards like Scourge of Nel Toth and Teysa, Envoy of Ghosts and Dread Return stronger in this deck. Generally all sacrifice outlets would be stronger. If you went this route you could include more cards like Evolutionary Leap, Champion of Stray Souls. 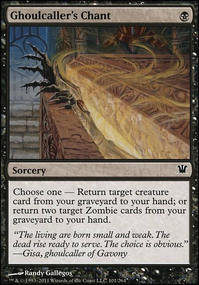 Also keep in mind if you have more recursion cards, you can justify putting in higher value cards like Moldgraf Monstrosity because you can just bring it back with a Karmic Guide or other reanimation card for cheaper than its actual cost. I'd replace Shambling Vent with Svogthos, the Restless Tomb. Its cheaper$$ and stronger in a karador deck. I think Deathreap Ritual could be a strong draw card too. It triggers on every end step, not just yours. I'd really consider a Skullclamp because it's essentially 1 mana to draw two cards if you're going to sacrifice the creature anyway (as long as it has more than 1 toughness). Shadowborn Demon i also saw. It could be a nice card to recur. 5/6 flying and destroy a creature ETB effect for 5 mana is nuts. more landbase: High Market, Selesnya Sanctuary, Golgari Rot Farm, Orzhov Basilica, Jungle Hollow, Scoured Barrens, etc. Link all cards in your question. The creature spell is separate from the creature's ability. It's not a requirement that you only cast Accursed Centaur if you can sacrifice something for its triggered ability. Note, however, that Accursed Centaur is itself a creature. 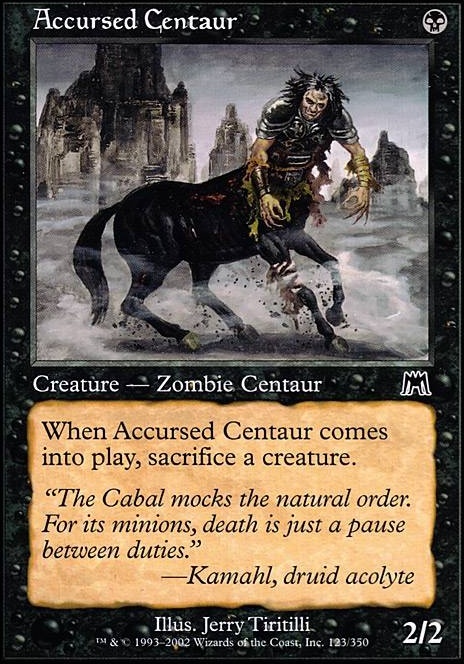 If you control no other creatures when its ability resolves, you'll have to sacrifice Accursed Centaur.